The following are honors core courses offered through the biology departments. Note that honors students are not limited to taking honors core courses only in their major. These classes won’t count towards the major but can be used to count towards Sophomore Honors or University Honors Laureate. See the list of honors core courses for additional course options outside of your major. MCB 1405, The Genetics Revolution in Contemporary Culture: This course introduces students to genetics and genetic technologies. Various forms of popular culture—news clips, movies, books, and art—are used to provide a framework for the syllabus and to introduce students to different genetics and technology topics. A textbook introduces the scientific material, which is discussed in the context of the interpretation of science in modern society. Students study the scientific principles of genetics and genetic technology as well as the impact these topics have had on our culture, attitudes towards science, domestic and foreign policy, medical practice, and law. The purpose of this course is to provide non-biology majors with an opportunity to undertake real world scientific research in a fun, supportive, and immersive environment. As part of the Small World Initiative, you will join with college students around the globe to crowdsource antibiotic drug discovery. Your guided independent research projects will involve taking soil samples, isolating bacteria within them, and testing them for antibiotic activity, and there is the opportunity for further pursuit of any promising findings. We have access to the database generated by students at other Small World sites, allowing us to explore issues of biodiversity, effective use of large data sets in the sciences, and the effectiveness of crowdsourcing for scientific research. At the end of the semester, your results will join that database. BIOL 2289, Introduction to Undergraduate Research: Introduction to the variety of research programs in the Life Sciences on the Storrs campus. EEB 3205, Current Issues in Environmental Science: Three credits. Prerequisite: Open to honors students; open to non-honors students only with consent of instructor. Recommended preparation: 8 credits of college level science. Readings and discussions of current issues in environmental science, emphasizing linkages between earth, oceans, atmosphere, and biosphere. Topics include: climate change; watershed changes; alternative energy; population growth; endangered biodiversity; genetically-engineered organisms; deforestation/restoration; risk assessment; tradeoffs; problem-solving; alternative futures. EEB 4896W, Senior Research Thesis in Ecology and Evolutionary Biology: Three credits. Hours by arrangement. Prerequisite: Three credits of EEB 3899, which may be taken concurrently; ENGL 1010 or 1011 or 2011; open to juniors or higher; open only with consent of instructor and department honors committee. Not limited to honors students. A “W” course for students writing a senior thesis on their independent research. MCB 2000, Introduction to Biochemistry: Students will meet for one additional 50 minute period per week to discuss and analyze current publications in biomedical research. The discussion will relate to the broader topics listed on the MCB 2000 course syllabus. 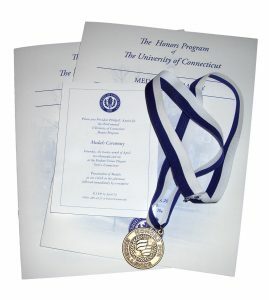 (Previous Honors student groups have investigated hemoglobin synthesis and thalassemia, the unfolded protein response and chemosensitivity, structural and biochemical studies of retroviral proteases, mitochondrial uncoupling and reprogramming cancer metabolism, insulin resistance and diabetes, cholesterol metabolism and cholesterol lowering drugs.) The Honors lab sections will differ from other lab sections associated with MCB 2000 in the opportunity to pursue a guided project. After acquiring basic laboratory skills, students will purify an enzyme and monitor the purification using techniques essential to any research laboratory. MCB 2210, Cell Biology: Structural organization of cells and the molecular basis of dynamic cellular processes, with emphasis on eukaryotic cells. Topics include protein targeting, vesicle trafficking, cytoskeleton, cell-cell interactions in tissues, and the molecular basis of related human diseases. MCB 2225, Cell Biology Laboratory: Four credits. One 1-hour lecture and two 4-hour laboratories. Prerequisite: BIOL 1107 or equivalent. Open to honors students; open to non-honors students with instructor consent. A laboratory experience that will prepare students for thesis research in the biological sciences. Experimental design, quantitative analysis and presentation of data. Topics include cell culture, fluorescence and time-lapse microscopy, DNA transfection, image processing, and flow cytometry. Students will also pursue independent research projects. A fee of $75 is charged for this course. MCB 2400, Human Genetics: To earn honors credits for this course students are required to use critical thinking and outside research to solve advanced problems in genetics, discuss and/or write short opinion pieces on current events, and write summaries of genetics research seminars they’ve attended. The purpose is to broaden student exposure to genetics topics–how genetics shapes our lives/behaviors/health, how research in the field is conducted, and encourage examination into the many controversial aspects associated with genetics/genomics advances and applications. Assignments vary from week to week and precise requirements for earning honors credits in this course will vary from semester to semester. MCB 2410, Genetics: To earn honors credits in this course students must read five different journal articles through the semester and complete an assessment of their understanding. They must also attend two research seminars during the semester. Supplemental readings illustrate current research in the areas being studied in class. MCB 4211, Basic Immunology: This section of the basic immunology course will expand on topics discussed in class and is required to receive honors credit. The honors section will meet once per week, 8 times during the semester. This section will focus on the HeLa cell line, its origins, and its contributions to biomedical research. Additionally, we will discuss the some of the current ethical and moral issues associated with human tissue research. Students will be expected to complete required readings before class and participate in “in class” discussions for credit in this section. MCB 3100, Introduction to Translational Research: Basic science and design of human subject research; participation in clinical, patient-oriented research projects in a hospital setting. MCB 3189, Clinical Research Laboratory: Participation in a clinical research study at a medical center. MCB 4989, Introduction to Honors Research: Laboratory research project carried on by the student under the guidance of a faculty member. The student is required to submit a brief report on the research findings at the end of the semester. MCB 4997W, Honors Research Thesis in Molecular and Cell Biology: Writing of a thesis based upon a student’s independent laboratory research project. PNB 3260, Stem Cell Biology: Principles of stem cell biology and the use and application of stem cells in research and therapy. Lectures and readings will focus on the molecular, cellular and physiological properties of stem cells, mechanisms of differentiation, use of recombinant DNA technology and application of stem cells and their derivatives in disease and injury. PNB 3299, Independent Study: Credits and hours by arrangement. Prerequisite: Open only with consent of instructor and the department honors committee. May be repeated for credit with change in topic. Designed for the advanced undergraduate student who desires to pursue a special problem as an introduction to independent investigation. PNB 3264W, Molecular Principles of Physiology: Four credits. Two class periods and one 4-hour laboratory. Prerequisite: PNB 2274, MCB 2410, or MCB 3010; ENGL 1010 or 1011 or 2011; open to juniors or higher; instructor consent required. Case study of a disease: genetics and inheritance patterns, molecular defects, including transcription and post-transcription defects, physiological defects, therapeutic approaches. PNB 4296W, Senior Research Thesis in Physiology and Neurobiology: Three credits. Hours by arrangement. Prerequisite: Three credits of PNB 3299, which may be taken concurrently; ENGL 1010 or 1011 or 2011; open to juniors or higher; open only with consent of instructor and departmental honors committee. Not limited to honors students. Special research or independent investigation for advanced undergraduates. Involves research and writing a thesis.